Jeff Carstetter discovered at twelve years old that he had a love affair with the automobile. In 1974, he landed a job as an apprentice in a sign shop that allowed him to begin designing graphics and lettering on commercial vehicles. In 1977, he came to Columbia to look around, loved what he saw, and 2 weeks later packed up and moved here… permanently. After accepting a job in a sign shop for a brief period, he was offered a position with a franchised company designing stripes and graphics for auto dealers. This is when he was introduced to auto accessories, including window tinting. By 1980 he decided to strike out on his own and opened the business that eventually became today’s Sun Shades & Graphics. It didn’t take long before his clients began to ask about tinting their homes and offices. While maintaining an excellent automobile business, Carstetter began to pursue the residential and commercial tinting business. In 1994 Sun Shades & Graphics acquired the VISTA Window Film dealership. This continued the changes within the clientele of Sun Shades & Graphics. Carstetter received the coveted degree in “Accredited Solar Control Specialist” from The International Window Film Association. By 2000 the majority of Sun Shades & Graphics clients were requesting residential and commercial tinting. Carstetter was becoming more and more involved with the home building industry. He was appointed to the board of directors of the Greater Columbia Remodelers Council (a division of the Building Industry Association) in 2001 for a 2-year term. In 2002 CP Films (now known as Eastman Performance Films) designated Sun Shades & Graphics as the only Platinum Dealer in central South Carolina. It was time for a major change within Sun Shades & Graphics. The decision was made to merge the automotive tinting and accessories business with Conrad Geiger of Auto Trim Design. While staying somewhat involved with the automotive business this would allow Carstetter to focus most of his energy and attention on residential and commercial solar control products. 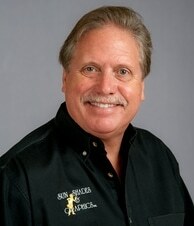 From 2002 until the present, Sun Shades & Graphics has continued to add more and more solar control products. They have become a one stop shop for all your solar control needs. In 2011 Carstetter was appointed to serve on the Executive Committee for the Green Building Council of Columbia. This will enable him to give and receive information about sustainable residential construction. With the ongoing issues of energy costs and demand, Carstetter can continue to give back to the community while learning and researching ways to keep our environment safe and clean. Jeff Carstetter, with his wife Sondi and a full time staff have almost 75 years of experience in the window tinting business. They pride themselves in providing mom-and-pop customer service as well as the most technologically advanced products in the world today. VISTA Window Film, Eastman Performance Films and Huper Optik Window Film have put Sun Shades & Graphics on the map as the provider of the "FINEST WINDOW FILMS IN THE WORLD."